Access to your own language teacher was already available in our Premium PLUS subscription, but mostly via email interaction. 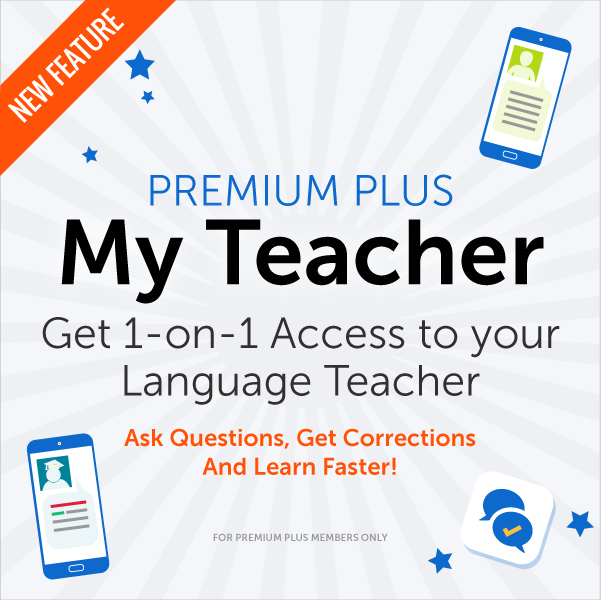 Now, there’s a new Premium PLUS feature that gives you 1-on-1 instruction on the website or on the go via an App: Premium PLUS My Teacher (formerly titled Premium PLUS Messenger). Get 1-on-1 learning with My Teacher! What is it? It’s a new App exclusively for our Premium PLUS subscribers. You get 1-on-1 access to your teacher on the site or on the go, anytime. Contact them while you’re studying with our Innovative Language lessons or for any language problems you have. Want to send longer texts (over 750 characters) or send a recording of yourself? Simply send your teacher an email and they’ll fix any mistakes and provide crucial feedback. That’s the power of learning with a native speaker. They give you personal attention and fix any problem you have. Imagine how fast your language will improve when someone’s guiding you every step of the way. My Teacher is for Premium PLUS subscribers only. Want to upgrade to a Premium PLUS subscription? You get the best of both worlds – unlimited Premium access, which includes 2,040+ Audio & Video Lessons, PDF Lesson notes, Study tools and more – plus, you get a teacher who creates a personalized learning plan and guides you along the way. Click here to choose from 31 language courses and subscribe to our Premium PLUS plan! P.S. Want to learn language with your own teacher & unlimited Premium access? Get the best of both worlds with Premium PLUS at 10% OFF! Unlock unlimited Premium access, including 2,040+ Audio & Video Lessons, PDF Lesson notes, Study tools and more. Plus, you get a teacher that creates a personalized learning plan and guides you along the way. New App Update! All 31 Innovative Language Sites Now On Your iPhone/iPad! 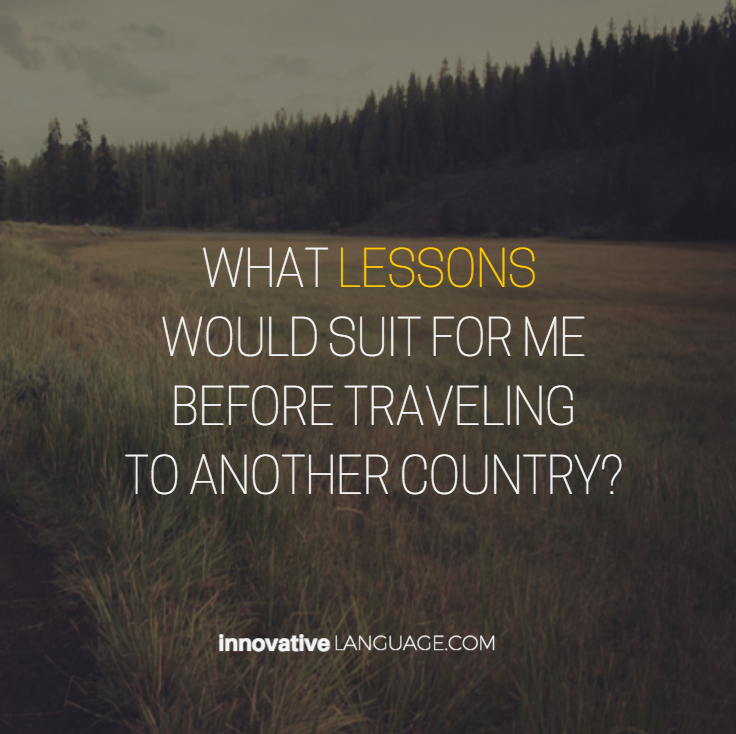 Want to take all of your favorite language lessons on the go? As in, take the entire learning system and learn anywhere on your iPhone or iPad? With the Innovative Language 101 App, you can. So far, only our JapanesePod101 listeners have had exclusive access to this app. Until now. We’ve updated the app and…. All 31 Innovative Languages, from ArabicPod101 to VietnamesePod101, are now available on the Innovative Language 101 App! What does this mean for you? It means you can learn 31 languages with our advanced learning system anywhere you go. Simply download the app for FREE, choose the language and use your current account details to log in. 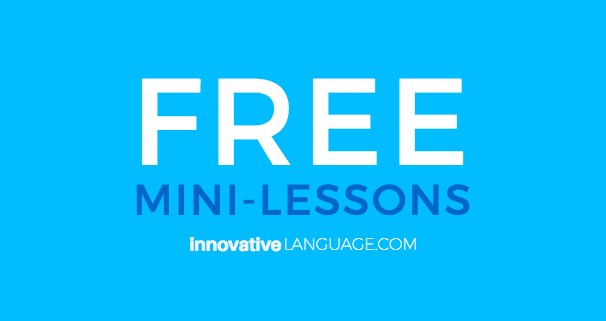 Click here to download Innovative Language 101 for FREE! Since most of you are already swiping and tapping on smartphones all day long, it makes sense to extend your access across different devices. With the Innovative Language Learning 101 App, you can study on your iPhone on the go with Lessons, Lesson Notes, Progress Tracking and Premium Tools, then switch to your computer and continue. All your progress is saved through magic we won’t bore you with. The App itself is free to download on the iTunes App Store. If you’re already a Free, Basic, Premium or Premium PLUS member, get the app and hop into your account. You’ve got instant access starting NOW. Innovative Lesson Tools: You get PDF notes, Line-By-Line Transcripts and Vocabulary Lists with audio (Requires active 7-Day Free Trial, Basic or Premium Account) Mobile-only users also have access to these features. Android User? Stay tuned! There’s an Android version in the works that will be based on the iOS App. 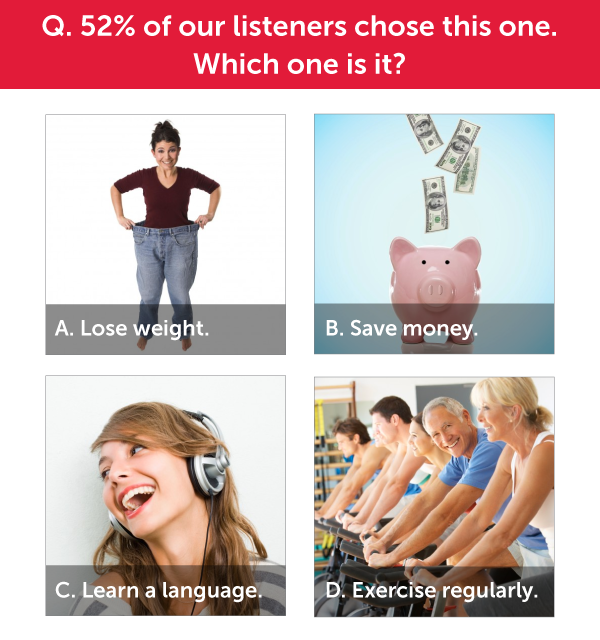 Click here to download the Innovative Language Learning 101 App for FREE! P.S. Learn 31 Languages with the Innovative Language 101 App! Choose from any of our 31 Innovative Language sites and take your language learning on the go! What Are The New Languages Coming This July? Looking for new language to study? Currently, there are 27 InnovativeLanguage.com languages that you can learn the fast, fun and easy way! And now that we’re done updating our lesson layouts, we’ll be adding even more languages! There are 2 new language sites and a whole lot of new content on EnglishClass101 coming July 1st and we’re revealing them here first! What are they? Based on user requests, we’re introducing British English, Persian, and Swahili. These new additions will bring the Innovative Language family to a total of 29 sites! British English? That’s right. We have EnglishClass101.com just for our English learners. British English itself has over 58 million speakers in the UK and opens you to over 780 million English speakers worldwide. It’s the world’s lingua franca! This July, you’ll find British English lessons on EnglishClass101.com as an alternative to the current American English lessons. However, if you’re a native speaker and want to brush up on your British accent, feel free to stop by as well! British English Lessons start July 1st. Click here to visit EnglishClass101! Persian is also known as Farsi. The good news? It has no articles, no cases, and nouns have no gender. In short, grammar will be easy and breezy. It also opens you up to over 110 million speakers in Iran, Afghanistan, Uzbekistan and Tajikistan. And since it’s part of the Indo-European language family, it’ll help you get a head start on Arabic (ArabicPod101.com) and Hindi (HindiPod101.com) as well! The bad news? You need to wait ‘til the site is launched! PersianPod101.com Coming Soon! Click here to sign up for the wait-list! Swahili is the easiest African language to learn for English and Arabic speakers. There are no lexical tones and it’s spoken just as it’s written. With over 140 million speakers, Swahili is the official language of Tanzania, Kenya and is the lingua franca of East Africa. We’re happy to have it as our first African language at InnovativeLanguage.com. And if you know what Hakuna Matata means (it means no worries), you’ve already started learning! 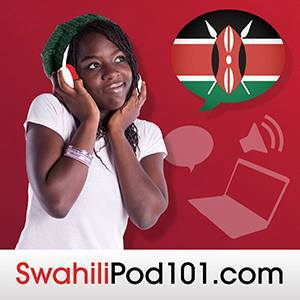 SwahiliPod101.com Coming Soon! Click here to sign up for the wait-list! P.S. July 1st is the day! 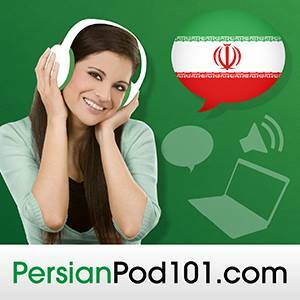 Stay tuned for PersianPod101, SwahiliPod101 and new British English lessons! There’s only one thing missing from making your language absolutely perfect. Someone to practice with. Someone who’ll fix every language problem you’ll ever come across. Someone who will turn you from a timid basic speaker to a non-stop foreign language speaking machine! Master Language With Your Own Teacher. 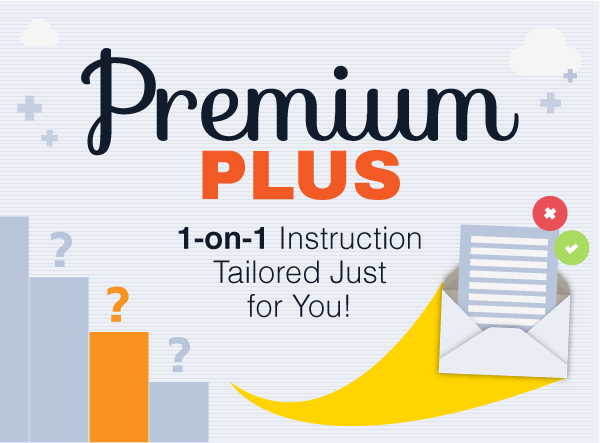 Subscribe to Premium PLUS and get the best of both worlds – all of our effective lessons, lesson notes, and Premium study tools. Oh, and all the help you’ll ever want from your very own teacher. Professional Language Assessment: Most self-taught learners don’t know their strengths and weaknesses. Skip their mistakes. Your teacher will assess your language level, iron out your mistakes and tell you what lessons fit your needs best! Personalized 1-on-1 Instruction: Is speaking your weak point? Need a bigger vocabulary? Get a study plan based on your needs. Your teacher will design a plan to turn your weaknesses into strengths! Writing Correction Exercises by Email: Got a question about grammar? Want to have your sentences corrected? Shoot your personal tutor an email and get answers to any language problem you come across within 24 hours. VIP Customer Support: As a Premium PLUS member, you get reliable and timely assistance from our 24-hour Customer Support team. Okay! I Want To Improve My Language. What Can I Expect? Upon subscription, you’ll receive an Assessment Test via email. Complete the test and your teacher will email you with your results, assessment and personal curriculum within 48 hours. Once you receive your personalized curriculum and begin your studies, you’ll also have access to your teacher by email and get answers to all your questions. Joining Is Risk Free! Your subscription has a 60-day money-back guarantee. If you’re not satisfied with your language progress within this time, shoot us a quick email for a refund. No hassles. No questions asked. How Do I Join? Choose from any of our 27 languages and click the corresponding link to start! Arabic: Click Here To Learn Arabic with Premium PLUS at ArabicPod101! Bulgarian: Click Here To Learn Bulgarian with Premium PLUS at BulgarianPod101! Cantonese: Click Here To Learn Cantonese with Premium PLUS at CantoneseClass101! Chinese: Click Here To Learn Chinese with Premium PLUS at ChineseClass101! Dutch: Click Here To Learn Dutch with Premium PLUS at DutchPod101! English: Click Here To Learn English with Premium PLUS at EnglishClass101! Filipino: Click Here To Learn Filipino with Premium PLUS at FilipinoPod101! Finnish: Click Here To Learn Finnish with Premium PLUS at FinnishPod101! French: Click Here To Learn French with Premium PLUS at FrenchPod101! German: Click Here To Learn German with Premium PLUS at GermanPod101! Greek: Click Here To Learn Greek with Premium PLUS at GreekPod101! Hebrew: Click Here To Learn Hebrew with Premium PLUS at HebrewPod101! Hindi: Click Here To Learn Hindi with Premium PLUS at HindiPod101! Hungarian: Click Here To Learn Hungarian with Premium PLUS at HungarianPod101! Indonesian: Click Here To Learn Indonesian with Premium PLUS at IndonesianPod101! Italian: Click Here To Learn Italian with Premium PLUS at ItalianPod101! Japanese: Click Here To Learn Japanese with Premium PLUS at JapanesePod101! Korean: Click Here To Learn Korean with Premium PLUS at KoreanClass101! Norwegian: Click Here To Learn Norwegian with Premium PLUS at NorwegianClass101! Polish: Click Here To Learn Polish with Premium PLUS at PolishPod101! Portuguese: Click Here To Learn Portuguese with Premium PLUS at PortuguesePod101! Russian: Click Here To Learn Russian with Premium PLUS at RussianPod101! Spanish: Click Here To Learn Spanish with Premium PLUS at SpanishPod101! Swedish: Click Here To Learn Swedish with Premium PLUS at SwedishPod101! Thai: Click Here To Learn Thai with Premium PLUS at ThaiPod101! Turkish: Click Here To Learn Turkish with Premium PLUS at TurkishClass101! Vietnamese: Click Here To Learn Vietnamese with Premium PLUS at VietnamesePod101! 5 New Languages - Learn Cantonese, Thai, Polish, Portuguese and Greek! In less than 1-month, PortuguesePod101, CantoneseClass101, GreekPod101, PolishPod101 and ThaiPod101 will open to the public and you can guarantee yourself 50% OFF FOR LIFE by joining the Founding Father’s Club! If you or someone you know wants to learn one of these languages, become a Founding Father and you will never pay more than 50% of the new site’s subscription price. You’ll also receive 25% OFF for friends and family. Click Here to Choose a Language and Become a Founding Father! Not interested in a new language? To thank you for taking us from 1 person to 16 sites, save 15% on your next subscription. Use the coupon code 15OFF on any site for your next purchase.